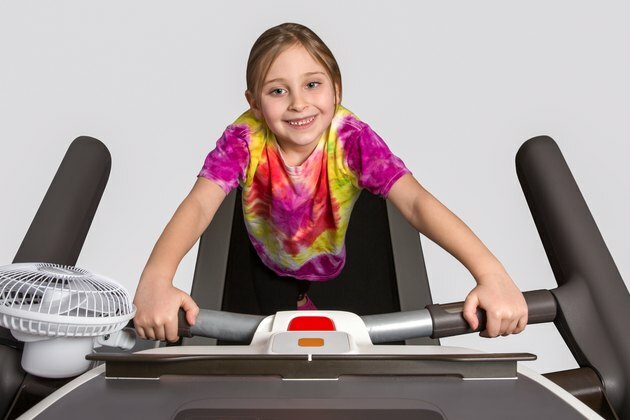 Can Kids Use a Treadmill? Kids should not use treadmills. It may be possible to ensure their safety while they're under your direct supervision, but when you're not around they might imitate your behavior and operate the treadmill, resulting in serious injuries or even death. As much as possible, keep your children away from exercise equipment. The U.S. Consumer Product Safety Commission tracks child injuries that result from using or being near exercise equipment. The commission estimates that, each year, 8,700 children younger than 5 and 16,500 children between the ages of 5 and 14 are injured using exercise equipment. The types of equipment involved include stationary bicycles, stair climbers and treadmills. Twenty percent of these equipment-related injuries resulted in fractures or amputations. Children may not be able to keep up with the high speeds a treadmill reaches, so they may trip and fall when using it. Also, children might insert their fingers between moving parts or around the edges of the running belt, leading to such serious injuries as lacerations, fractures or amputation. The moving parts of a treadmill pose a significant risk to children, but the power cord is also dangerous. Children can strangle themselves while playing with the cord, so you must mount the cord in such a way as to make this impossible. For example, secure the cord with ties so children cannot slip it around their necks, or use a power outlet that is inaccessible to children. If possible, unplug the treadmill when not in use and store the cord so children cannot access it. If you have children, you should buy a folding treadmill that you can store when you're not using it. Another option is to choose a treadmill model that has a tethered safety key, which you attach to your clothes; if you fall, the key pulls out of the machine and turns off the motor. You can also protect your children by taking the safety key with you so they cannot turn the treadmill on without your knowledge. As an added safety precaution, keep your treadmill in a locked room where children cannot access it. How Do I Open a Folding a Treadmill?